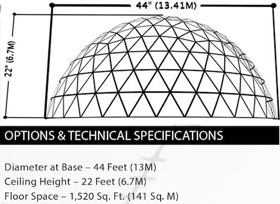 The swissnex Dome is a full-dome structure that allows a 360° spatialization of images and sounds, taking the audience on a fully immersive and unique experience. Hosted by swissnex Boston, Consulate of Switzerland. 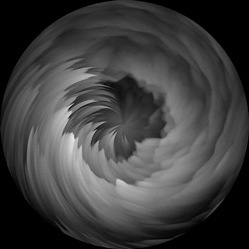 Eye of the Storm (2015) was originally built as a four-channel sculptural video installation that referenced the shape of a hurricane eye and its rain bands. 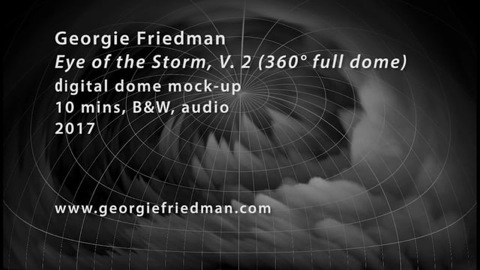 In this 360° full dome adaptation, the swirling cloud-like forms and soundscape further envelop the viewer. * All events under the swissnex Dome are free of charge with the HUB pass. Please arrive 15 minutes early, even if you’ve registered, to ensure your place. Rising Tide, consists of footage I filmed in Antarctica (Jan 2017). I've digitally layered waves from the Antarctic Sound over Antarctica's icy landscape, so they "rise" and visually submerge the land. Since the piece is sited on City Hall, I started thinking about Boston’s history with water and land in relation to the in-filling of Back Bay and the harbor to expand the city from the 1640s-1900s. Looking forward to the years 2030-2100, the City has initiated a research study, Climate Ready Boston, which examines how different areas (especially ones on the waterfront) may be affected by rising sea levels. By projecting the "rising" waters of Antarctica, on to Boston's City Hall, I want to link our city, and the present moment, with the bigger picture.